Whats the difference between the different De Buyers? Mineral B, Blue Steel etc. 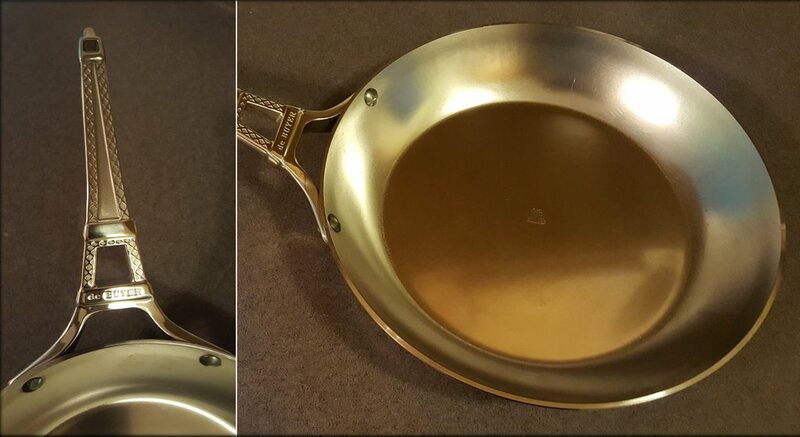 Since my favorite cast iron pan was inadvertently stuck deep in storage during the move, I decided to pick up a De Buyer skillet. I've always wanted a nice carbon steel pan, so it was a good excuse. I have to say that this thing is drop dead gorgeous right out of the package. I bought an 11" Mineral B from their French Collection series, complete with the Eiffel Tower handle (a totally cool touch). I thought I'd better take a photo now, because it will never look this good again. So do I! Beautiful pan. 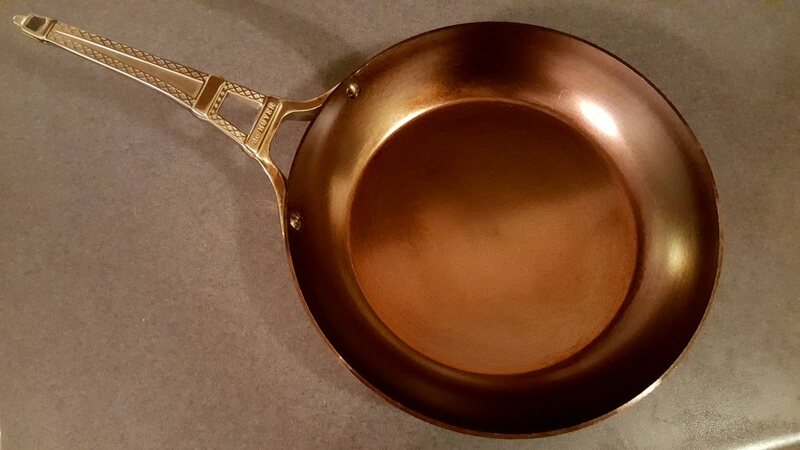 After seasoning the pan (with flax oil) and cooking with it several times now, it's started to take on a nice patina. The photo doesn't really do it justice. It's actually darker than what it appears. Compared to my cast iron, I really like the feel. It's heavy, but not super heavy and heats up in about half the time. The problem I've run into - and really, it's just a matter of my getting used to it - is that I've been running the heat a little hotter than I need to. Whereas I normally cook steak at medium high, in this pan medium seems to work better. But overall, I love it. I made seared duck breasts in it last night. If you've ever made duck breasts, you know that you have to drain off the oil several times during the searing process. Even with the duck in the pan, I had no problem picking it up to pour off some of the rendered fat. I couldn't do that with the cast iron pan. With that one, I'd have to remove the duck, drain off the fat, and return the meat to the pan. That is a beautiful pan. We're tossing around the idea of getting one of their carbone Woks and ring so we can REALLY stir fry on the propane gas burner. But, we're going to start remodeling a bathroom in stages and bought the new vanity and mirror/medicine cabinet yesterday so discretionary income (AKA mad money) is well on it's way to being used up, given that we are going to replace toilet too and still have to buy the new faucet, drain, whatever parts are needed yet. That's what I call kitchen jewelry Steve. No kidding, that's a drop dead gorgeous pan and you deserve it! Be sure to use Barkeepers friend every time you use it, so it stays brand new beautiful. Love the handle!! Steve, I have extreme arthritic hands. Since cast iron is out of the question, do you think an 11-12 inch one of these sauté pans would be feasible for me? Addie, I would have to say no. I just weighed my 11" skillet and it's 4.85 pounds. It's lighter than my 6 pound 10.25" cast iron skillet, but not by much. It does feel more balanced, though. One thing that might be noted, however, is that the De Buyer 12" skillet has the addition of a "helper handle" so you can use 2 hands to lift it. My smaller pan doesn't have the helper handle.